Scratch Bakery in downtown Durham is a place I always mean to get to more frequently but simply don’t. For one, the hours are a little wonky (they close at 3:00 or 4:00 most days). And, for two, pie is totally delicious and if I went to Scratch more often all them pies would end up in my thighs, if you know what I am saying y’all. Scratch got its start at the Durham Farmer’s Market as the project of Phoebe Lawless, a well-seasoned pastry chef who has worked at restaurants such as the Magnolia Grill. After much success at the Farmer’s Market Lawless decided to open up a brick and mortar location in downtown Durham near the intersection of Rigsbee and Chapel Hill Road–an area that is becoming quite a little foodie hub, what with the proximity of Rue Cler and Reliable Cheese Company. My friend Annah and I were looking for a quick and easy lunch spot last week and decided to go to Scratch. Annah had never been, and I wanted to return since I had only visited once. Early this year I stopped by Scratch on my lunch break (I was working in downtown Durham then) and had a slice of shaker lemon pie. The pie deftly balanced sweet and tart, and was unusual in that it featured whole slices of lemon. The crust was fantastic and flakey. It was unlike any pie I had ever tasted. I was excited to try Scratch again and also to try some of their savory options. Scratch has a small, seasonal menu and pies and lunch items rotate regularly. They always have a few salads and a few sandwich options for lunch. They also have savory pies like empanadas and tomato pies. Another great feature is their takeaway case–just the thing if you want to bring home something to nibble on later. 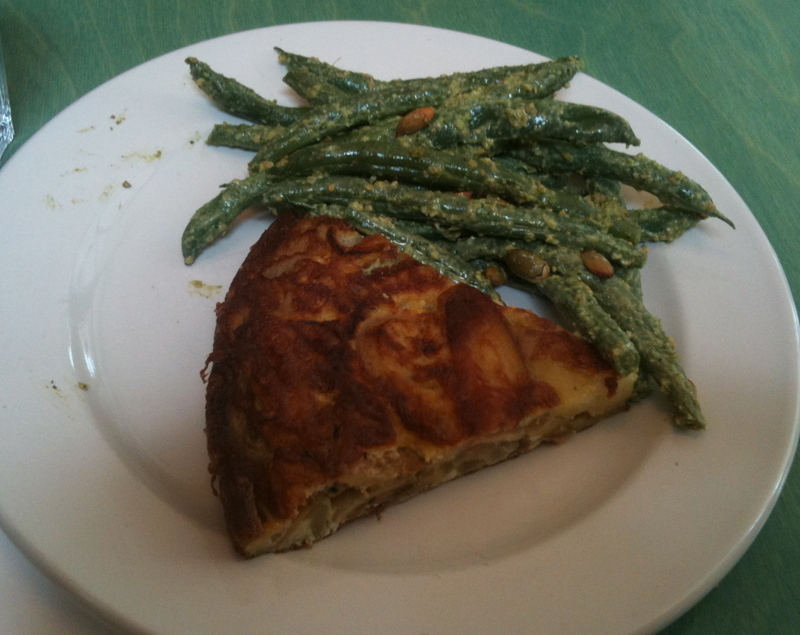 Annah and I both decided to get a slice of Spanish tortilla with a side of green bean salad with a pumpkin seed pesto. Annah also got some balled cantaloupe with mint to go with her lunch. I love Spanish tortilla: deep-fried potatoes baked with onions into a frittata-like dish. A cold slice of this was perfect for lunch, tasty and reminiscent of the Spanish tortilla nights some friends and I used to have in college. Spanish tortilla is delicious and relatively easy to make, but it makes a huge mess and isn’t the best food for you, so it was definitely a special occasion dish. The green bean salad on the side was also tasty, with fresh, toothsome green beans and a flavorful, light pumpkin seed pesto. Annah and I were both happy with these choices. Of course I had to get a slice of pie for dessert. 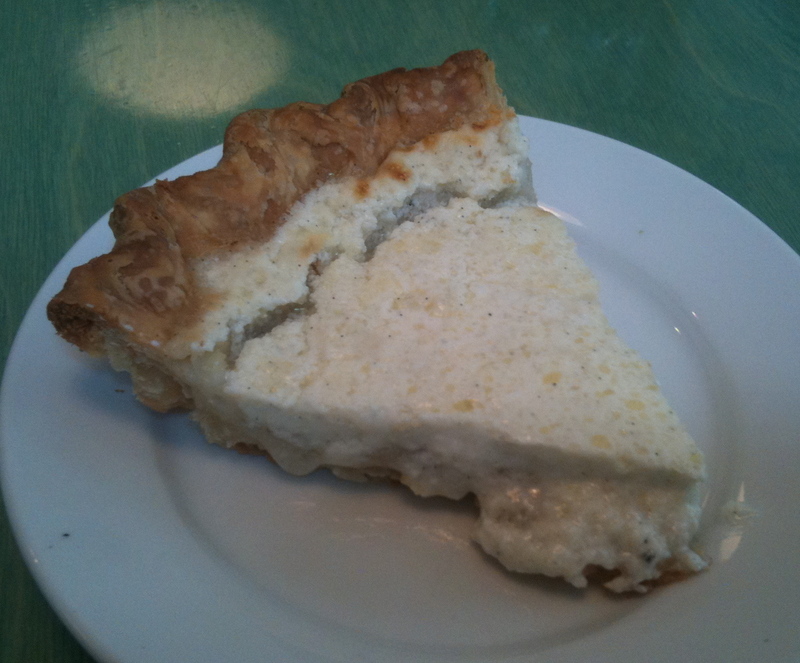 I settled on a slice of buttermilk sugar which, like the shaker lemon pie I had back in the winter, was unlike any pie I had ever tasted. Sweet and tangy, the buttermilk had an almost ricotta-like consistency. The crust had a sugar coating that gave a nice crunch and a slight hit of sweetness, but not too sweet. This was an excellent slice of pie, my friends. I really like Scratch. Some people have complained that the prices are steep but I got my lunch and pie all for under $9. I can also see how the space must be a madhouse on weekends. I went at 1:00 on a weekday and had to lay claim to a table pretty quickly. However, it was all worth it–the food was great! Next time I am in downtown Durham and am looking for something a little different, and sweet, for lunch, I will stop by Scratch.